The sold out hardcover now in paperback. 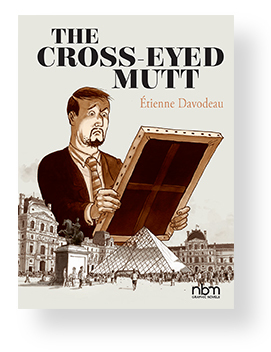 Etienne Davodeau is a comic artist. He doesn't know much about the world of wine-making. Richard Leroy is a wine-maker. He's rarely even read comics. But these two are full of good will and curiosity. Why do we choose to spend one's life writing and creating comics or producing wine? How and for whom do we do them? To answer these questions, for more than a year, Etienne went to work in Richard's vineyards and cellar. Richard, in return, leapt into the world of comics. They opened a lot of bottles and read many comics. They traveled around, meeting authors and wine-makers sharing their passion for their jobs. The first time a book explores the nature of a man's vocation with a true life representation of it from two very different perspectives. They get to realize they both have that precious and necessary power to bring people together. See the Wine Spectator feature. "As Davodeau notes early in the book, “Here’s something that counts: feeling the devotion and pleasure felt by the guy who made the wine . . .or the book.” It’s a simple point, but one that is frequently lost in our commodified world." "The artwork is gorgeous. Highly recommended." "World Top 50 Wine Book 2013. One of the best ever written to understand wine, it does the same for comic books. A masterpiece." "Davodeau’s proficiency as a storyteller is apparent on every page of this entertaining and enlightening account." "Davodeau's lines are clean and economically sparse, but powerful enough to forge the bonds that tie both professions together." "It's hard to imagine a more pleasantly told story." "This intensely thought-provoking graphic novel makes us pause to consider our relationships with other people and asks us to think about who we are, what we do, and how we perceive and relate to the world around us. Consummate skill in illustrating moments of careful consideration and reflection so important to both of his characters’ vocations." "Engrossing piece of comics reportage. 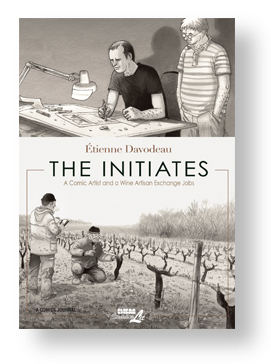 The sheer amount of foresight and raw faith that goes into making wine as a commercial proposition is a wonder to behold, and Davodeau does his best to capture every step and draw every esoteric piece of equipment that Leroy deploys." "Truth be told, comic strips, graphic novels and animation leave me cold. Don’t hate ‘em, they simply hold no fascination for me. That said, I was enchanted by The Initiates. It’s a compelling read." "I’m just going to come out and say it: The Initiates is one of the best books about wine I’ve ever read, period. For anyone looking to break out of their personal and professional comfort zone, The Initiates is a well-illustrated inspiration." "The excellent writing, characterizations, and tranquil-yet-stimulating vibe make this a treat to savor slowly, like wine." "This nugget in black & white is both graphic novel and autobiography. Proposing discovery of the making of a wine and a book at the same time, the story is up to the natural and living nectar it’s looking to make evident." "Five out of five stars." "A superbly crafted graphic novel. Highly recommended." At the end of yet another unproductive job interview, Lulu, on a whim, takes off for the shore just to get away from it all. She's got a husband and kids left bewildered but it's nothing against them. This is just her time, getting away from the grind and being taken for granted with no other plan than savoring it. Surprised at her own temerity, she meets other people on the edge of the world. It wasn't meant to be for long. It wasn't meant to be anything but in the end, thrilling, fun, and possibly dangerous, this improvised experience will make of Lulu a different woman. By the author of the acclaimed The Initiates. "BEST COMIC OF 2015. The art is extraordinary at capturing the ordinary, from Lulu's joyful homelessness to her daughter's surprise at where her mother's new life has taken her." "Capably transitions from kitchen tables to beaches, talking heads to dance parties—no location or emotion is beyond the reach of his expression. Such art softens the blow of nothing ever turning out as expected and turns it to delight. Best experienced all in one sitting, like a long exhalation." "This is a tale that can be related to by many people… I was instantly drawn to the mellow simplicity of it all." "The graphic novel Gone Girl." "A wonderful addition to NBM ComicsLit’s library"
"The quiet competence of the artwork brings a stillness to the work, as if characters and readers alike are holding their breath in anticipation of ... what? 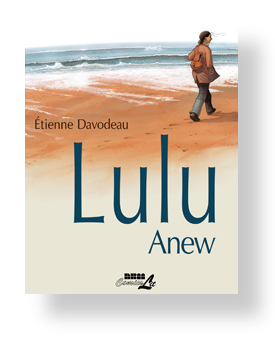 The narrative gives you an answer, but as with “Lulu Anew” in general, the reader will have a genuinely personal reaction." "The rather astonishing achievement of Étienne Davodeau's new graphic novel is that, despite telling a tale that screams "Lifetime movie," it's actually both surprising and unique." "Mature readers will appreciate Lulu’s bittersweet journey as she sheds the trappings of an unfulfilling life and forges a new path for herself." "Skillfully unsentimental characterizations, light and earthy watercolors, and everyday goings-on reveal a familiar recognizable world, but Davodeau (The Initiates) merges these elements into an enchanting realism. Davodeau’s brilliance is connecting it all into a deeply affecting story about how we seek to change our lives." "Pleased to see more of his work available in English, and looking forward to seeing how he fares with a fictional narrative."